The parents of Alfie Evans, a 23-month-old with an unknown degenerative neurological condition, lost their appeal in a British court Monday to move their son to Rome for further testing and treatment. The court ruled that the Alder Hey hospital in Liverpool can remove the toddler from life support. The judge agreed with the hospital’s determination that Alfie "could not be saved" and that it would be "unkind" and "futile" to continue treatment. Alfie’s parents, Tom Evans and Kate James, may make a further appeal to the Supreme Court and appeal court judges said Alfie would continue to receive treatment pending a Supreme Court decision. "Transferring our stable son MAY be a risk?? ?” Tom Evans wrote in a Facebook post following the decision. "But removing his life support and letting him suffocate and die isn't???????!!!!!! “Where's the logic in that?” he asked. 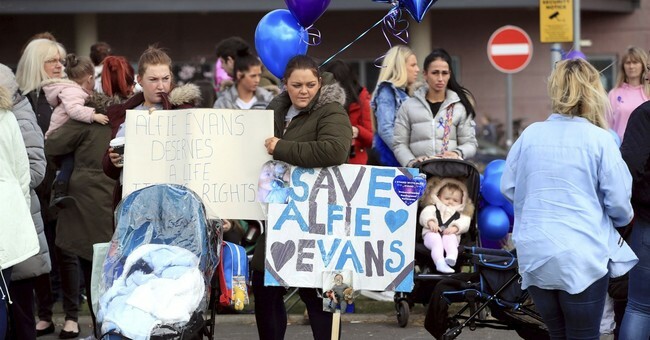 Protestors have gathered outside the hospital in support of Alfie’s parents. Pope Francis tweeted his support of Alfie Evans and his parents earlier this month. Sunday, he included Alfie in his public prayers. “I entrust to your prayers persons like Vincent Lambert in France, and little Alfie Evans in England, and [persons] in various countries who live, sometimes for a long time, in a state of serious infirmity, and are medically assisted for their basic needs,” he prayed. The legal struggle over Alfie’s treatment is occurring less than a year after the Great Ormond Street Hospital in London took baby Charlie Gard off of life support after a similar struggle with his parents who wanted him to try an experimental treatment for his rare genetic condition. Charlie Gard’s case drew an international public outcry against the hospital’s decision that included Pope Francis, President Trump, and Cher. President Trump and Pope Francis both extended offers of support to the family and two Congressman even introduced legislation to try to help bring baby Charlie to the U.S. for treatment.